A woman sits next to her malnourished baby at a therapeutic feeding center in a hospital in Sanaa, Yemen, Jan. 24, 2016. The medical aid charity Doctors Without Borders is calling for guarantees from Yemen’s warring parties that medical activities will be protected in accordance with international humanitarian law. In a statement Monday, the medical charity, also known by its French name Médecins Sans Frontières (MSF), said the conflict is being waged with total disregard for the rules of war. “It is causing enormous suffering for people trapped in conflict zones,” said Raquel Ayora, MSF director of operations. MSF says that since October, its medical facilities in Yemen have been bombed four times, with two hospitals, a clinic and an ambulance coming under fire. 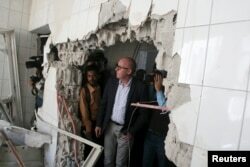 Resident Coordinator of the United Nations in Yemen, Jamie McGoldrick, inspects damage at a hospital in Yemen's southwestern city of Taiz, Jan. 21, 2016. The charity says it has asked the International Humanitarian Fact-Finding Commission to conduct an independent investigation into the attack of one of its hospitals. “Increasingly, we are seeing attacks on medical facilities being minimized as ‘mistakes,’” Ayora said, as the charity has yet to receive an official explanation for any of the incidents. MSF says the first attack took place October 26, when airstrikes, reportedly by the Saudi-led coalition, hit an MSF-supported hospital in Saada Governorate. The Saudis deny that its forces carried out that attack. The latest bombing occurred January 21, when a series of airstrikes in Saada Governorate struck an ambulance from an MSF-supported hospital in the area, killing six people, including the driver. The Saudi-led coalition has been conducting airstrikes in Yemen since late March, targeting Iranian-backed Shi’ite Houthi rebels who forced President Abdu Rabu Mansour Hadi to flee the country. The fighting has thrown the Arab world’s poorest nation into a deep humanitarian crisis, with the United Nations reporting that 80 percent of the population — some 21 million people — require assistance.